Latest news: 23 cm beacon now on air from Alkmaar JO22IP on 1296.918 Mc. This beacon is build by Ruud, PE1BTV and myself. Frequency 1296.918 Mc, output just over 4 W, antenna design from UHF-Unterlage teil V, page 1004. The driver (also by G4DDK) is followed by the Power Amplifier design of G4BAO, this followed by an 3 stage filter (made by PA0MHF). The different power levels on the stages are 15 mW, 0.5 W en 4 W. Most parts were collected from different Hams off the shelve, so was the final PA out of use for some time with me because a new PA was build, please check this article on this site regarding 23 cm's. Apart of the SHF part there was another challange, the antenna. 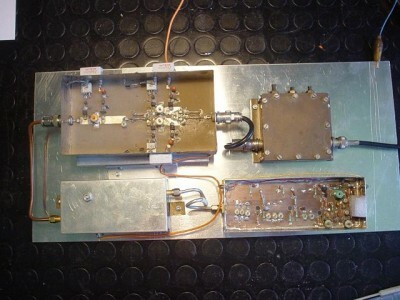 After an experimental antena with 4 stacked clover-leaf PCB now an German designed antenna is used with about 6 dB more gain. This antenna is published in UHF Unterlage part 5 page 1004. Picture of the beacon in my shack, with the old french design PA.
On the right bottom the oscillator and multiplier, output about 15 mW on 1296.919 Mc. Left bottom the driver with about 0,5 W output, above that the original PA, producing approx. 7W. This PA is now replaced by an prototype PA from John G4BAO unsing an SRF6522-60 on 24V. Top righthand side the bandpass filter (filter build by PA0MHF).